On March 3, the universal Church celebrates the feast of St. Katharine Drexel, a Philadelphia heiress who abandoned her family’s fortune to found an order of sisters dedicated to serving the impoverished African American and American Indian populations of the United States. Katharine was born November 26, 1858, into a wealthy and well-connected banking family. The family's wealth, however, did not prevent them from living out a serious commitment to their faith. Her mother opened up the family house three times a week to feed and care for the poor, and her father had a deep personal prayer life. Both parents encouraged their daughters to think of the family's wealth not as their own, but as a gift from God which was to be used to help others. During the summer months, Katharine and her sisters would teach catechism classes to the children of the workers on her family’s summer estate. The practice would prepare her for a life of service, with a strong focus on education and attention to the poor and vulnerable. While traveling with her family through the Western U.S., Katharine witnessed the poor living conditions of the Native Americans. Eventually, while still a laywoman, she would give much of her own money to fund the missions and schools in these seriously deprived areas. Eventually, however, the young heiress would give more than just funding to these much-needed missions and schools. She would decide to devote her whole life to the social and spiritual development of black and American Indian communities. The inspiration for this work came to her during a visit to Rome, where she was granted an audience with Pope Leo XIII. During that time, Katharine had been considering a vocation to cloistered contemplative life as a nun. But when she asked Pope Leo XIII to send missionaries to Wyoming, he told Katharine she should undertake the work herself. In February of 1891, she made her first vows in religious life – formally renouncing her fortune and her personal freedom, for the sake of growing closer to God in solidarity with the victims of injustice. Although African-Americans had been freed from slavery, they continued to suffer serious abuse, and were often prevented from obtaining even a basic education. Much the same situation held in the case of the native American Indians, who had been forcibly moved into reservations over the course of the 19th century. Katharine founded the Sisters of the Blessed Sacrament, for the purpose of living with these communities while helping them acquire education and grow in faith. Between 1891 and 1935 she led her order in the founding and maintenance of almost 60 schools and missions, located primarily in the American West and Southwest. 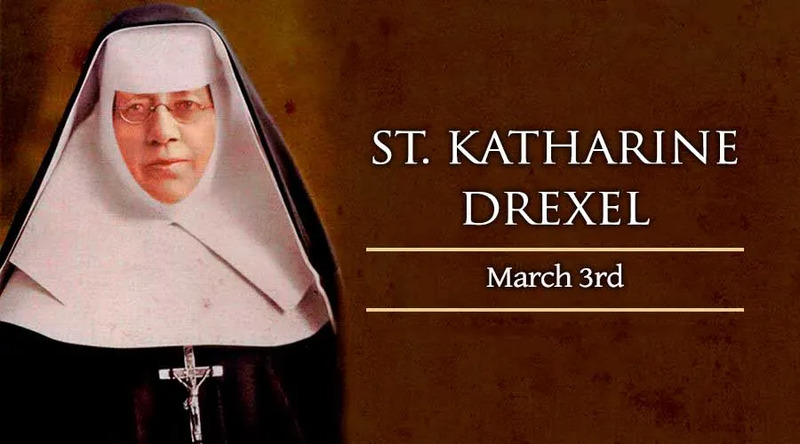 Among the prominent achievements of Drexel and her order is New Orleans' Xavier University, the only historically black Catholic college in the U.S.
Katharine was forced into retirement for the last 20 years of her life after she suffered a severe heart attack. Although she was no longer able to lead her order, she left the sisters with her charism of love and concern for the missions. She died on March 3, 1955 and was canonized by Pope John Paul II on October 1, 2000.